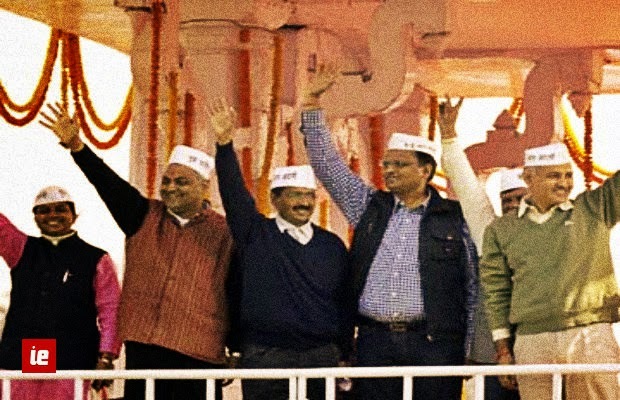 The curtains are down for Delhi’s most controversial yet active government. Politics in Delhi had never been so interesting for the last 15 years, and nobody actually cared what Shiela Dikshit was doing until the man with the the Jhaadu-weapon came and swept her away. But has the Kejriwal-led Government done justice to the Aam Aadmi of Delhi who voted AAP to power? Should the Aam Aadmi regret his vote, or is it an indication of a massive undercurrent in favor of AAP? Time to dissect the 49 days of chaotic governance. 1) Campaigning against VIP culture, ending it to a certain extent, and then falling into the trap of government facilities- a very simple mistake that could have been avoided had Kejriwal not been so anti-bungalows right from day one. His justifications came very late. Instead, lies followed, and the last one was unearthed when an RTI revealed that it was Kejriwal who had asked for 5 BHK bungalows. Being a CM, it was the least he could have asked for considering the high-profile guests that would visit him, but the negativity around the houses made him a villain- the aam aadmi of Delhi compared his cramped 1 BHK with Kejriwal’s twin 5 BHK’s and the answer was clear, Kejriwal was no longer an Aam Aadmi. 2) Inexperience of the young cabinet hurt the AAP Government the most, be it Rakhi Birla or Somnath Bharti. Rakhi Birla, an ex-journalist, must have realized that it is always easier to be on the other side during an interview, for she really did not handle the media well when asked about her sudden switch from auto to the government paid car. And then followed the decision to procure new cars for Delhi ministers, a decision that only hampered their Aam Aadmi image. 3) No matter which government comes to power, the ones sleeping on footpaths really don’t care, nor does the government work for their betterment. The reason is simple- they do not have voter IDs. But here was a government which was quick, proactive and adamant- they wanted night shelters for the homeless- other decisions could wait. If it is difficult to appreciate this effort, then maybe sleeping outside in the cold for one night is the answer for you. 4) One department which faced the wrath of Arvind Kejriwal was the Delhi Jal Board. Officials were transferred, suspended and made answerable. There were sting operations by news channels, the tanker mafia was being attacked by the volunteers of AAP itself, and the residents of Delhi were hopeful that the water supply might improve. But a mess that was created for decades can not be solved in 49 days Mr. Kejriwal. The hope has now crashed, yet again, and half of Delhi will again face irregular water supply, and the DJB officials will breathe free. 5) 20Kl of free water was announced for 3 months. The next government will not have the courage to stop this freebie, for freebies once announced are never revoked in India. Nobody knows how water was supposed to be free for 5 years and maybe the next government will never know how to supply free water. What has Delhi earned from it? A burden on its economy because the mess was never sorted out. 6) Electricity rates were slashed by 50% for users with low consumption, again for 3 months. The Discoms are crying, bleeding and threatening to quit, but AAP has always maintained that there are irregularities in the profits of these companies. The residents of Delhi are dying with curiosity to know the logic behind all this, but again, nothing was revealed, and the aam aadmi of Delhi was busy preparing himself for 10 hour long power cuts. 7) The CAG audit of Discoms- a very uncommon move by any government since the Corporate-Government nexus has always flourished without any accountability in India. Every Delhiiite wanted to know how these agencies were making breathtaking profits, but did the 49-day government reveal anything substantial? The CAG is advisory in nature and can only table its suggestions, and the law enforcement agencies need to act on these recommendations. The report will never be discussed in the Delhi Assembly- it does not exist any longer. Who loses? The Aam Aadmi. 8) Mr. Sisodia remained very actively involved as the Home Minister and Education Minister of Delhi – maybe the short tenure of AAP was always on his mind. There were some surprise checks to act against missing teachers in schools and also check the quality of Mid-day meals. As a result, quick decisions followed. If every minister remains this active for 5 years, India might change completely before the 2019 Lok Sabha elections. 9) Every school was given funds for immediate repairs. Again, a good move considering that Government Schools have terrible infrastructure and are never given funds for repairs. But Mr. Sisodia, who will monitor how these funds were used? 1 lakh, even though it will hardly make any difference, can not be used by our lethargic schools within 20 days. Again, no accountability for this money after the fall of the government. 10) Coming to Mr. Somnath- the media’s favorite for he was always in the news for the wrong reasons. Mr. Somnath was accused by the High Court for tampering with proofs, but AAP blatantly refused to accept it. The party, which had always demanded resignations from ministers without any investigation, was busy defending the same, even though it may have been right. But to the general public, AAP had backtracked on its own principles, yet again. Danish Woman gets raped in Delhi, Mr. Somnath names her in the press conference. Journalist asks a tough question, Somnath calls him a Modi-paid journalist. Only if Somnath had been trained on how to deal with Indian Media, he could have avoided these goof-ups. The Midnight Raid: While every media house accused AAP of moral policing, the Somnath Bharti led raid did make sense, for the citizens had already approached the police twice. The police ignored the complaints, nobody noticed, Somnath Bharti tried to help the people, and he became racist. The “we-do-not-have-search-warrants” was a lame excuse by the police to hide its inefficiency. Would they look for a search warrant if Dawood Ibrahim was executing a drug deal in Khirki Extension? Somnath never called the media, they reached on their own. The scenes of Somnath fighting with police officials were ugly, but did the media really show the reality? Only the residents of Khirki Extension could answer, and they answered by calling Somnath their ‘Hero’. Was he racist? Maybe yes, according to the media. 11) Dharna All Night by Kejriwal – the biggest mistake. The Delhi Governmentt does not have any control over the Delhi Police. Shiela Dikshit recorded this message and played it every time something wrong happened in Delhi. But Mr. Kejriwal was in no mood to repeat these words. He did the unthinkable- dharna outside the home ministry. Was Mr. Kejriwal out of legal options? Couldn’t the Delhi Government openly debate this issue with the Home Ministry officials and look for options? No way was the violence by AAP supporters justified. Demanding suspension of a few officials was never a solution to Delhi’s problems. Instead of Dharna, a lot of other legal options could have been explored. Asking supporters to stay away, and then calling them to join the Dharna was meant to cause chaos. Kejriwal was once again caught changing his statement. Outcome of the Dharna? Police officials were sent on leave and by now, they must be back in the department. The intention to fight it out with the Home Ministry was good, but Mr. Kejriwal, days of activism are over. A government fighting against another government will lead to unforeseen chaos in India, please respect this. Nobody would like to see Telangana activists sitting on Dharna outside the Home Ministry, and everybody will curse you for starting such a trend. 12) FIR against Shiela Dikshit and Anil Ambani, but will they ever be punished if found guilty? Just filing an FIR and running away after 49 days, is that the AAP way of investigating corruption cases? If Shiela Dikshit gets a clean chit from the next government after the investigation, AAP will have no right to protest, for it threw away the opportunity to show its zero-tolerance towards corrupt ministers. 13) Helpline for nursery admissions and a dedicated anti-corruption helpline- good initiatives if they keep continuing what they are meant for. 14) 5500 new permits to autos, thereby legalizing autos that were always present on the roads of Delhi but never had permits. Surely, the auto drivers will be relieved as they will not be harassed by the police and can operate freely in the NCR region. But the move to make the autos accountable to the transport department instead of the Delhi Traffic Police could have been disastrous for the already frustrated citizens of Delhi, as the Delhi Traffic Police is the only force the auto drivers fear. 15) Exempting bills of all those who participated in the ‘Bijli-Satyagrah’. This can not be debated much because it was very clearly mentioned in their manifesto, even though such moves are extremely biased and should not be encouraged by any government. 16) SIT probe into the 1984 Sikh Riots- Is it something new? The Sikhs have seen a number of investigations, but was the intent ever there in any government to punish the culprits? I’m sure the Sikh community did see some hope in Arvind Kejriwal, but this has lasted only for 49 days. The report will definitely give a clean chit to all Congress leaders once again, but the Sikh community is now immune to such investigations, and AAP has only given one more to them. 17) While the AAP government has done ‘exceptional’ work considering the track record of all the governments in India, such quick decisions were expected from a party that is busy establishing its identity before the Lok Sabha elections. Some decisions were bold, but not even a single policy was implemented completely. 18) Removing FDI in retail was again a decision that will hit Delhi’s economy in the long run, but as it was included in their policies, one can not complain about the decision. Also, the BJP is against FDI in retail, but has always called AAP ‘Leftist’. It is strange that the same BJP has removed FDI in Rajasthan. 19) The Swaraj Bill was finalized, but never introduced. Nobody knows how Swaraj was to be implemented. How then can AAP spread the idea of Swaraj before testing it in anywhere in India? Delhi was the best place to start with, but sadly the opportunity has been lost. 20) The biggest expectation from AAP was in curbing crime against women. They had 49 days, but nobody remembers any major decision being taken to make Delhi safer for women. Setting up fast track courts is not a solution to stop the crimes, it can only facilitate the victim in getting speedy justice. A citizen’s task force was planned, but it was never put into place officially. Citizen’s task force can surely be a bigger threat to Delhi’s girls considering its chances to become the “Moral police of Delhi”. But on the whole, Delhi is still the same and AAP has lost the most important opportunity to win the hearts of Delhiites. The police is not under the Delhi government, even Kumar Vishwas and Kejriwal were forced to repeat this. 21) Some of the best initiatives were seen in the Health Department. Satyendra Jain did some really good work by visiting hospitals regularly, making sure hospitals maintain sufficient stock of medicines. Also, 100 new Ambulances were planned for Delhi which already faces a very severe shortage of Ambulances. Only had the government completed these new initiatives, Delhi could have given a thumbs up to the Health Department, but again, everything remains on paper after 49 days. New beds were added for the poor in hospitals. 22) Citizens action team for PDS, a much needed move to involve citizens in the correct distribution of food meant for the poor. 23) 10 crore allocated for Sports in Delhi, again a really good initiative. 24) Moving the Millennium Bus Depot away from the Yamuna- a mistake done by the Shiela Government which was always opposed by environmentalists. Though Shiela Dikshit said that Delhi does not have enough space for a new DTC bus depot, it seems very strange that new malls are cropping up every year in Delhi. 25) Simplifying the VAT structure was one of the main agendas of the AAP government and Arvind Kejriwal was quick to use his skills acquired during his tenure in the IT department- VAT was simplified and relief was provided to small scale businesses. Good or bad, only IT experts can give the implications of this move. 26) And finally the Jan Lokpal. The JLP was the landmark bill that AAP had been banking upon, but going all out against the Central government and the Lieutenant Governer only exposed the wide gap between AAP and the ‘Gaurdians of the Constitution’. There are a lot of conflicting terms in the constitution [read here] according to which neither AAP nor the LG are wrong, but the way the bill was forced into the parliament only portrayed AAP as ‘Anarchist’ who were against the constitution. Kejriwal always knew that the bill would never be allowed by BJP and Congress and following the constitutional procedure would take years to complete. Also, the Lok Sabha model code of conduct would be soon introduced and going to the Lok Sabha elections without the ‘Jan Lokpal Bill’ would only cause embarrassment to them and therefore the only move available was to press the ‘Self Destroy’ button and become a martyr- the first of its kind which wanted to show that it is not hungry for power- only to fight the Lok Sabha elections to get the highest level of power. During the 49 days, though the Kejriwal-led AAP government started some really good initiatives and took very important decisions quickly, the fact that none of them reached a final conclusion may not go in its favor. The intention was there to bring about quick change in Delhi, but the Mamta Banerjee style of dharna is just not the way a government should work. They are not leftist, nor against capitalism, but yes they are not totally away from the two. AAP has lost a very important opportunity by becoming a martyr of its leader’s statements, but surely, there are a lot of positives as well.